Today, New York City’s default speed falls to 25 mph. 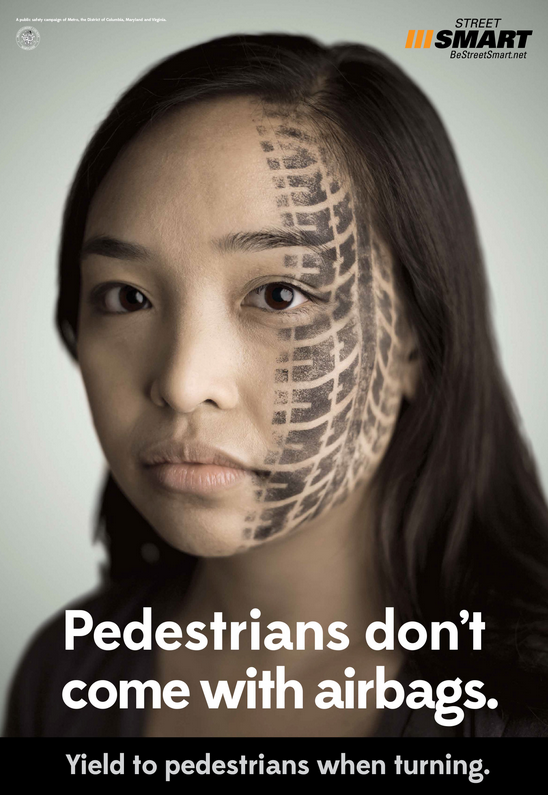 The change is part of Vision Zero, an ambitious campaign to reduce the city’s 4,000 annual pedestrian injuries and 250 deaths through citywide strategies that include stricter enforcement and safer design. It’s nuanced work, according to Kenna Williams with Sherry Matthews Advocacy Marketing. Williams says that making drivers continuously aware of pedestrians is actually trickier than urging seat belt use or discouraging drunk driving. “There are so many more points of decision,” she says, explaining that the choice to put on a seat belt or call a cab after drinking are both “split-second decisions.” But from staying attuned to the street (instead of, say, texting) to paying attention at crosswalks and intersections, prioritizing pedestrians from the dashboard involves a stream of back-to-back choices. Sherry Matthews Advocacy Marketing created a Street Smart campaign for Washington metro. “It really emphasizes the vulnerability of the human body to vehicles,” Williams says. When the firm tested their concept on focus groups, she says, drivers showed a marked changed. But after seeing the ads they seemed to “internalize the fact that ‘I’m walking away and they’re not,’” Williams says. Another agency trying to spur behavioral change is the New York City Police Department. Martha Norrick, director of citizen-workforce engagement with the NYPD, hopes social media will be a powerful communication tool. As part of a new initiative, every precinct commander will now have a Twitter account. Through interacting with neighborhood activists, local newspapers, bloggers and New York City officials, Norrick hopes that NYPD can address the many little violations that drivers make — turning while pedestrians are still in the crosswalk, rolling through stop signs and running red lights. The department has also been installing intersection cameras, but Norrick says that direct communication can complement infrastructure upgrades. “We’re very interested in how you can use little nudges to help address people’s behavior,” she says. She cites research about communicating norms — showing students in a university setting that a majority have fewer than six drinks a week, for example. Binge drinking may be so high profile on campus that students believe “everyone is doing it,” but show them actual data and they’ll be less likely to binge drink. Likewise, in such a fast-moving city, traffic violations might seem like the norm. “But we want to highlight how normal it is to follow the rules,” Norrick says. Resetting driver norms is key to Williams’ work as well. Both drunk driving and leaving seat belts unbuckled were not always taboo behaviors, but that’s changed. Both campaigns want to show that inattentive driving is also a big deal; that — as the Vision Zero campaign points out — serious crashes are neither acceptable nor inevitable.